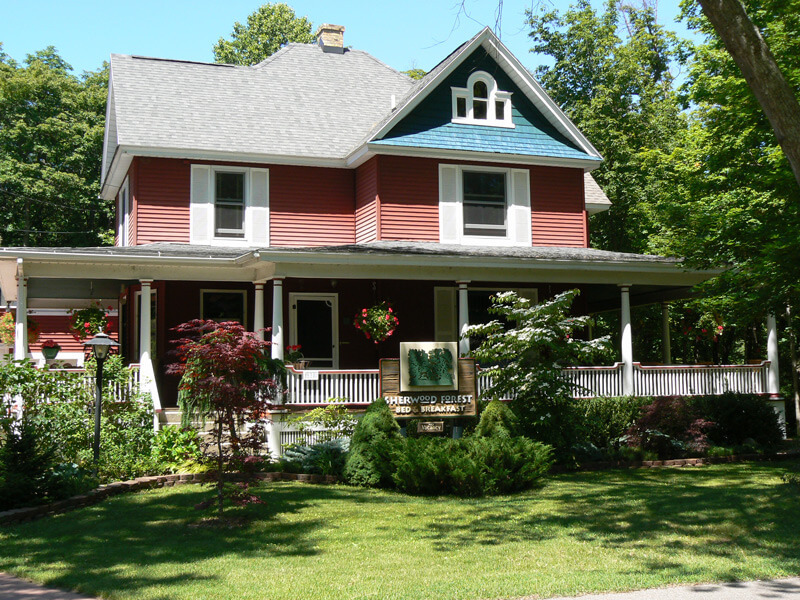 Sherwood Forest Bed and Breakfast, in a beautiful Victorian home, offers inviting elegance in a wooded setting in a quiet neighborhood. Six rooms/suites with private baths and a private standalone 1400 sq. ft. cottage. Hardwood floors, leaded-glass windows, oak-paneled staircase and wrap-around porch add to serene relaxation in ideal surroundings. 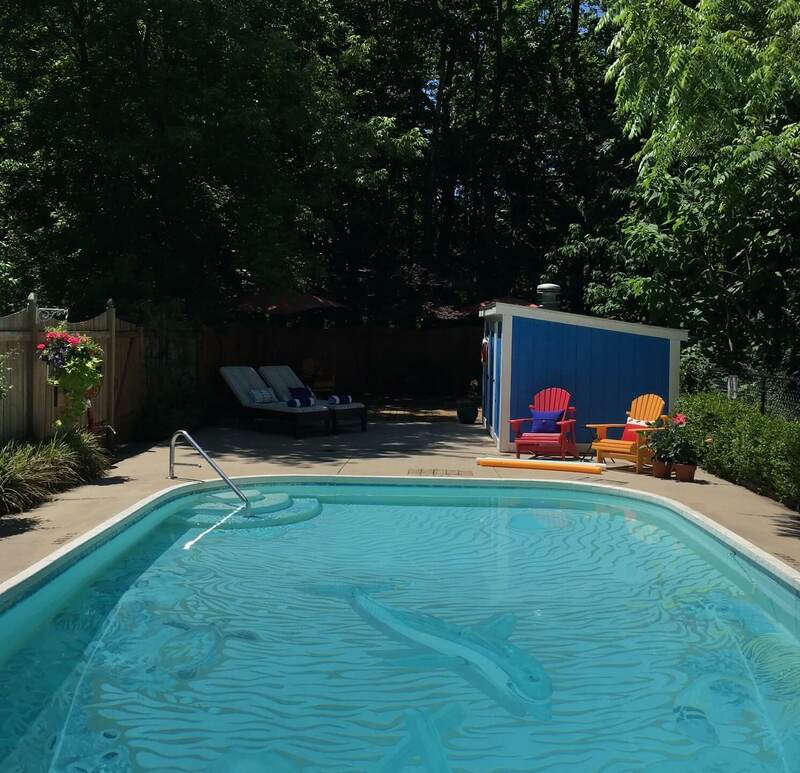 A heated in-ground pool tucked in the forest adds to your summer enjoyment, or walk half a block to swimming and sunsets at a Lake Michigan public beach. 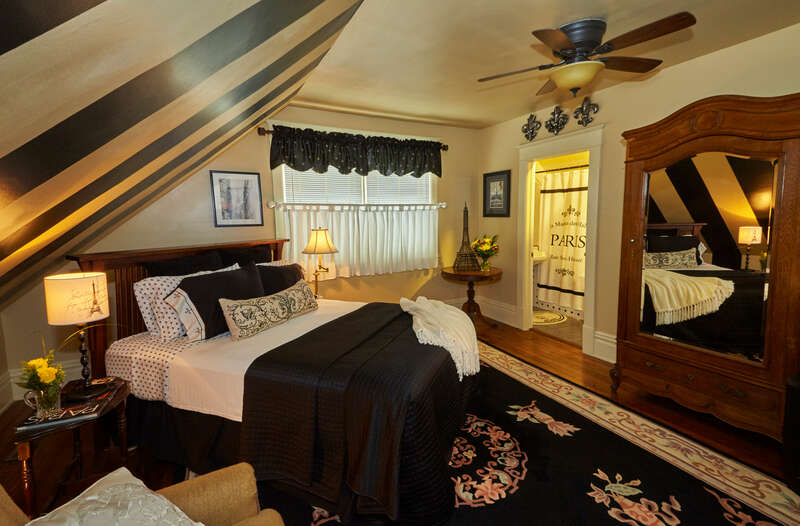 Perfect for romance or a much-needed getaway, our spacious individualized guest rooms are complete with antiques, cozy wing chairs, Jacuzzis, fireplaces, private baths, queen-size beds, A/C and free Wi-Fi. Safari Suite: Our signature 400 sq. ft. Safari Suite takes you on a journey into Africa, beautifully decorated with authentic South African artwork. It includes a large sitting area, glass tiled shower and claw foot tub, complimented by a private deck floating in the woods. 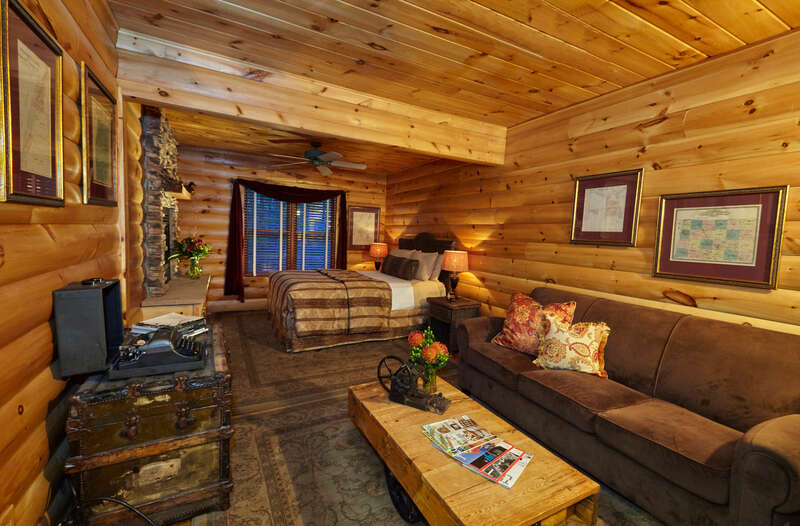 Log Cabin Suite: This Suite reproduces the serenity of the north woods, replicating the inside of a log cabin. It includes a sitting area, and a stone-mantle gas fireplace viewed from either the two-person Jacuzzi or the comfort of the bedroom. 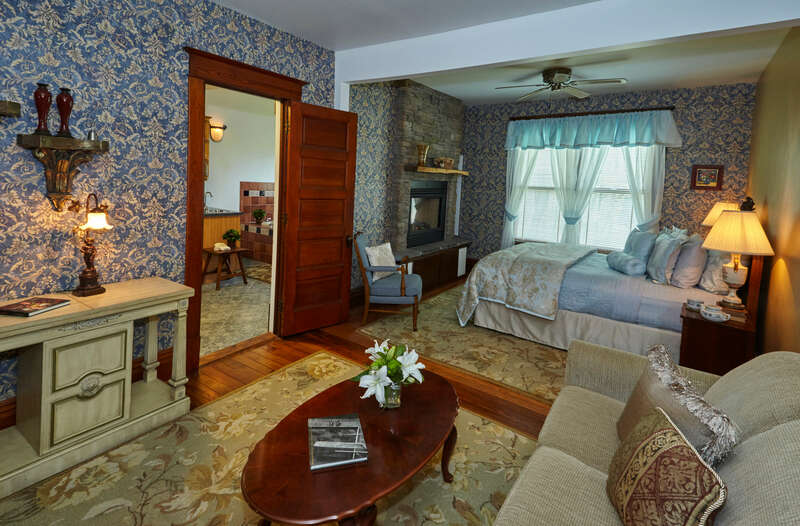 Victorian Suite: This suite is decorated in the flair of the late 19th century and includes a sitting area, with a stone mantle gas fireplace viewed from either the two-person Jacuzzi or the comfort of the bedroom. Our remaining rooms each have their own character. 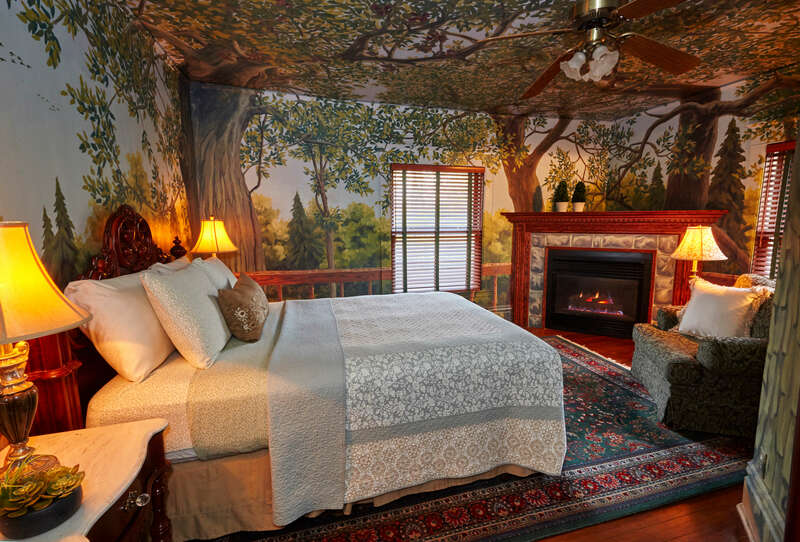 Spend the night in our Tree Tops Room surrounded by a hand-painted mural that transforms the room into a canopied tree loft, complemented by a gas fireplace, or travel to Paris in our Black and White Room, complete with a two-person Jacuzzi! In every detail, it is clear that care has been taken to provide an environment ideal for unwinding and relaxing. Breakfast is served each morning featuring such favorites as raspberry streusel coffeecake, English scones, blueberry buttermilk pancakes, or our special Sherwood Forest hash brown bake topped with a fried egg. In summer, swim in the heated pool, adorned with a spectacular, hand-painted mural of a sunken Greek ship embedded in a coral reef, surrounded by amphora vessels and a rainbow of fish swimming beneath the ocean waves. Or walk a half-block to a Lake Michigan public beach. The area's wide, white sandy beaches are the perfect place for strolling, swimming, or watching beautiful sunsets. Cottage: Perfect for a vacation with family or friends, the 1400 sq. 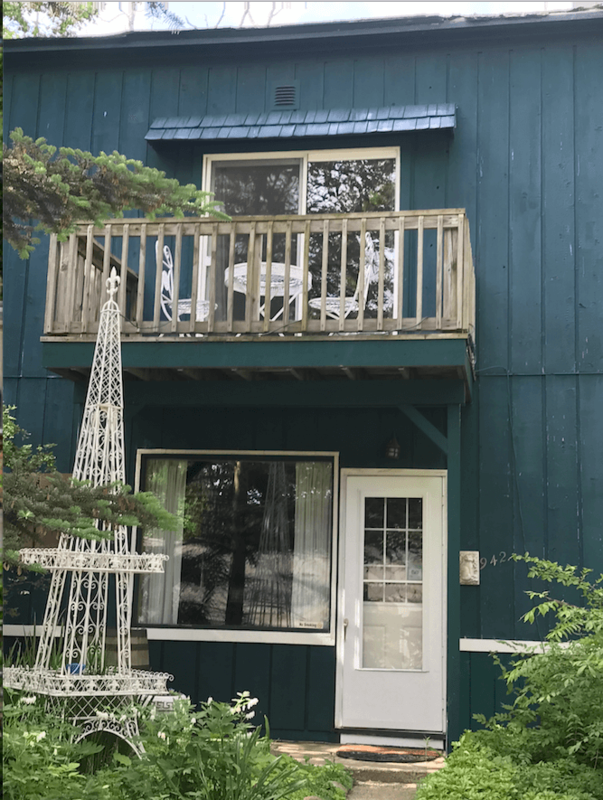 ft. Cottage is a convenient, affordable, and well-equipped Lake Michigan beach rental with a gas fireplace, two bedrooms, one-and-a-half baths, large living room with a TV monitor and DVD player, air conditioning, full kitchen, washer/dryer in unit and deck with gas barbecue. Sleeps up to 5 people. Free Wi-Fi. Sorry, breakfast is not provided with the Cottage. Your tastebuds will dance with delight, staying at Sherwood Forest Bed and Breakfast. Every delectable breakfast is skillfully prepared by an innkeeper who is a trained chef. Only fresh, organic ingredients are used. Custom-tailored dinner events are possible when you reserve the entire inn. Gourmet picnic baskets are also available, tailored to your preference. Looking for a cooking class? Hands-on collaboration with a skilled local chef can be a wonderful way to experience a cooking class and then enjoy the bounties of your own hands. Foodies are enticed to this inn and the area because of the culinary experiences they will have during their visit. The Saugatuck and Douglas area has multiple local, award-winning restaurants in which to savor a scrumptious gourmet meal in a picturesque setting. Or if you want to take it down a notch, go out for a great burger with a waterside view. It’s a great foodie experience, your way! 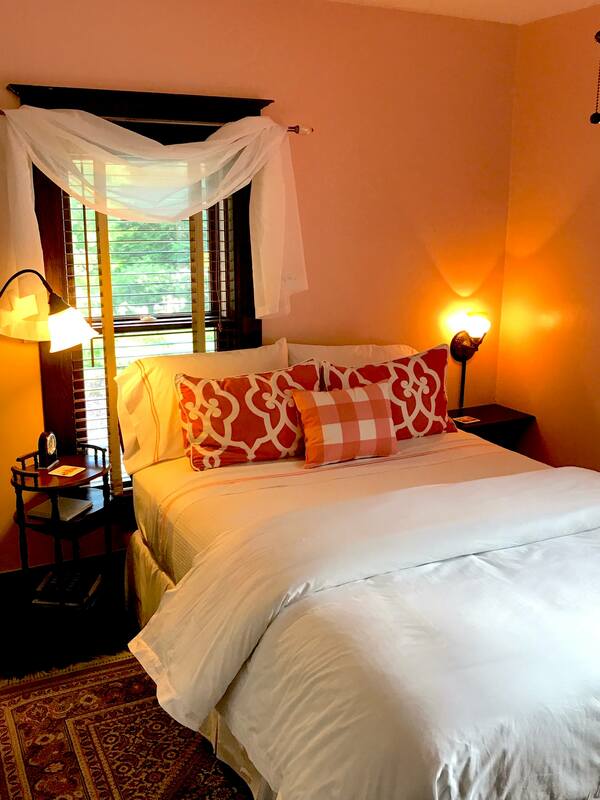 Cupid has nothing on the romantic setting you’ll find at Sherwood Forest B&B. Leave your children with the in-laws and come and rekindle your romantic side. Sherwood Forest has several suites with lovely fireplaces and large Jacuzzis. 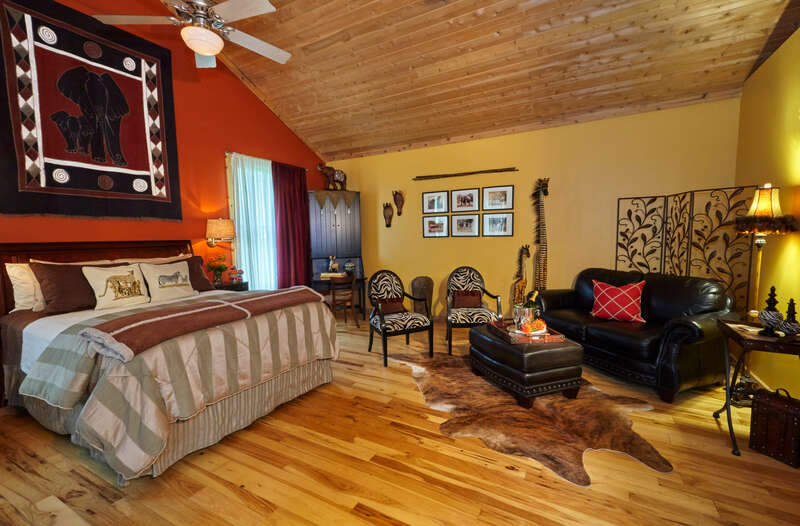 Or you can walk on the wild side and book our VERY private Safari Suite for the two of you. Enhance the romantic experience with a bottle of champagne, a bouquet of roses, a wine and cheese tray, or a relaxing massage in the privacy of your own room, all available for you! Reconnect with that special someone as your stand with your feet in the sand while you experience a spectacular sunset over Lake Michigan, or enjoy a delightful dinner at one of the many wonderful restaurants in the area. Sherwood Forest will quickly become your special retreat to celebrate those important milestones in your lives, or when you simply want to escape everyday life and reconnect. True to its name, Sherwood Forest is surrounded by lush, natural woods. 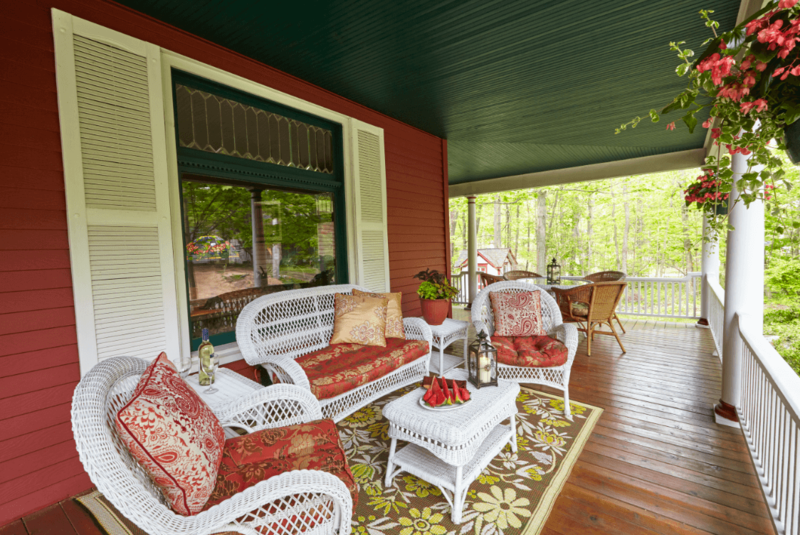 Relax on our wrap-around porch and see the magic of Mother Nature in every direction. Palliated woodpeckers, hummingbirds, and singing cardinals are just some of the birds that you are sure to experience. Sit long enough and you will see deer, wild turkeys, pheasants, and maybe even a raccoon or two walk through the woods bordering the house. Hop on a bike and pedal down to the local beach, or take the trail, 12 miles to nearby Holland. Getting overheated? Don’t worry, Sherwood Forest Bed and Breakfast has a wonderful heated pool overlooking the surrounding forest. Take a dip and relax while enjoying the peaceful setting. At the end of a day, stroll down half a block to the sugar-sand beach on Lake Michigan and envelop yourself in an amazing natural environment, complimented by vibrant hues of color in the sky as the sun slips down past the horizon, creating a magnificent sunset. What a way to end your day! Hold on to your hat, because the adventure is just about to start. Our area offers a variety of activities to pique many different interests. Fore! Enjoy a round of golf at an Arnold Palmer Signature course for 18 holes or take a private private lesson. Charter a fishing or sailing excursion and explore all that Lake Michigan has to offer. If you are more into the athletic approach, rent a Hydrobike and pedal down the Kalamazoo River, go kayaking or paddle-boarding, have fun on a jet ski, climb the 312 steps to the top of Mt. Baldhead, or hop on a bike and ride the 12 miles to Holland. Want more? How about a gourmet picnic basket brimming with delectable treats for a wonderful lunch at a nearby state park or relax on an award-winning beach. But wait, there’s still more! Both local towns are chock-full of boutiques, art galleries, shops and even an antique mall, making it easy to find just that right gift to take back home. Let the adventures begin! How about an engaging experience for that special beer lover? Sherwood Forest B&B has partnered with the local micro-brewery to bring you a memorable experience during your stay. You can do a special tasting of several types of beers and take a behind the scenes tour of this outstanding brewery. Want to brew your own beer? We can do that for you as well! You will work side by side with a trained brewmaster to brew and bottle your own beer. Choose from 70 different recipes and create your own brew in professional brewery equipment, being guided every step of the way. Advanced reservations required, of course, but the memories you will create will last a lifetime! The sound of waves gently lapping on the shore is sure to exude tranquility. Half a block from the bed and breakfast is Lake Michigan. Stroll leisurely down to the beach and relax on the shores of this beautiful body of water. Don your sunscreen and take a great novel, because you won’t want to leave this awe-inspiring setting any time soon. If you get too warm, wade in for a cooling dip or stroll along the shore with your feet in the water. What a way to disconnect from the pressures of everyday life! The Saugatuck/Douglas area has built a reputation as the Art Coast of Michigan. Stroll in and out of the many galleries and shops located in these two great towns surrounding Sherwood Forest B&B. An award-winning performance center, the Saugatuck Center for the Arts, is a great spot to catch a concert or a theater performance. Go a few minutes early and walk through the art gallery and amazing sculpture gardens before the show. Nearby is the long standing Oxbow School of Art located on the waterfront, where many aspiring artists have come over decades to hone their craft while being guided by skilled teachers. If music is your scene, every Wednesday night throughout the summer months, a free concert is given by local musicians in Wicks Park, nestled right on the water. Spread out your blanket and experience great music in an outdoor setting. So much to experience while you stay in our area.